According to reports coming in, two Tibetans have set themselves ablaze in two separate incidents of self-immolation in Sangchu County, which has already seen 5 Tibetans immolate themselves. Lhamo Tseten, 24, set himself afire near the Amchok Township Court at 2:30 PM (local time) in Sangchu County in Amdo, Eastern Tibet. He succumbed to his injuries at the protest site. Lhamo is survived by his wife Tsering Lhamo and a two year old daughter Nyingmo Kyi. He was son of father Namchuk Tsering, 49 and mother Sungdue Kyi. Ajam cited witnesses saying Chinese Security and Armed Forces immediately arrived at the protest site but the local Tibetans gathered around the body to prevent the Chinese forces from taking the body. His charred body is currently with his family member. “Following the self immolation, a large number of Chinese Armed Forces and Chinese Security Police are deployed in an area and the situation in Amchok is described as tense and under strict surveillance,” Ajam said. Another Tibetan, Tsephag Kyab, 21, set himself on fire at 8PM (local time) in Labrang region in Sangchu County, Eastern Tibet. Tsephag Kyab’s charred body is in the hands of his family members. He was son of father Lumo Jam. The deepening crisis inside Tibet has witnessed large scale anti-China protests and a series of self-immolations that has now seen 60 Tibetans set themselves on fire, since 2009, demanding freedom and the return of the Dalai Lama from exile. Police in China's Gansu province are offering rewards for information about planned self-immolations by Tibetans. The authorities in Gansu's Gannan prefecture say recent immolations affected social stability. They add that those who tell police about planned immolations will be awarded 50,000 yuan ($7,700; £5,491). Information about those who organise immolations will also be rewarded. Dozens of people have set themselves on fire since such protests began in 2009. The majority of them are believed to have died in the protests. 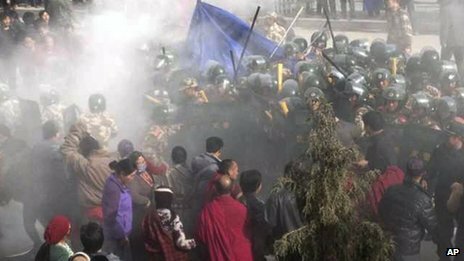 At least two are believed to have died since Monday, the latest in a recent spike of Tibetan protests inside China. A notice issued by Gannan police says the immolations have "seriously impacted social stability and harmony as well as people's ability to live and work". It says: "Anyone who reports and informs the legal authorities on the people who plan, incite to carry out, control and lure people to commit self-immolation will be awarded 50,000 yuan." It also adds that anyone who provides genuine information about what it calls the "black hands" - referring to those behind four recent self-immolations - will be awarded 200,000 yuan. This is believed to be the first reward offer of its kind in the region. Gannan has been the site of a number of self-immolations this year. On Monday a man, believed to be in his 50s, died after he set himself on fire near the Labrang monastery. A day later another Tibetan set himself on fire in the same region. China's authorities have so far proved unable to halt the self-immolations. News have just come in of another self immolation protest in Tibet. 3 Tibetans from Sangchu County have resorted to self immolation since Saturday to express their protest against China's policies and demand the release of the exile Tibetan leader His Holiness the Dalai Lama. In less than 48 hours of the self immolation of Lhamo Kyab on Saturday in Sangchu county, another Tibetan man from the same county has set himself on fire earlier today in an apparent protest against China’s continued occupation of Tibet. Sonam, a monk of Drepung Monastery in South India, said Dhondup, 61, of Hor Khagya (spelled as pronounced) set himself ablaze at 9:47 am (local time) on the main road near Labrang Monastery in Sangchu County, Eastern Tibet. He became the oldest Tibetan from Tibet to end his life due to self-immolation. Sonam cited eyewitnesses saying people circumambulating the monastery formed human cover around Dhondup’s charred body to stop it from getting into the hands of Chinese authorities. Later, the management committee of the monastery took Dhondup to hospital where he was declared dead. Dhondup is survived by his wife Dolma Tso and foster son Rinzin Choephel. The same source said no further details were available due to tense situation and heavy security presence in the area. On Saturday, Lhamo Kyab died near Bora monastery in Sangchu county moments after he set himself on fire. The month of October alone has witnessed five deaths due to self-immolation in Tibet. The deceased were Gudrub, 43, Sangya Gyatso, 27, Tamdin Dorjee, 52, Lhamo Kyab, 27 and Dhondup, 61. “We again strongly reiterate our long-standing appeal to the international community to press the Chinese government to end the deepening crisis in Tibet,” said Kalon Dicki Chhoyang of the Department of the Information & International Relations. The deepening crisis inside Tibet has witnessed large scale anti-China protests and a series of self-immolations that has now seen 57 Tibetans set themselves on fire, since 2009, demanding freedom and the return of the Dalai Lama from exile. Another Tibetan has set himself on fire today in protest against China’s continued occupation of Tibet in Bora, Sangchu region of Amdo, eastern Tibet. Chinese armed forces in Wonpo region of Dzachukha, eastern Tibet following the arrest of five Tibetans on October 15, 2012. In continuing crackdown and arbitrary detentions in Tibet, Chinese security personnel have arrested five Tibetans in Wonpo region of Dzachukha, eastern Tibet. Speaking to Phayul, Jampa Yonten, a monk living in south India with close contacts in the region said the arrests were made during a night raid on October 15. The identity of those arrested and their wellbeing and whereabouts are not presently known. The same source said that the next day, Chinese authorities summoned one member each from every family in the Wonpo region and warned them against carrying out protests during political re-education sessions, which they said, will be carried out in the area. “Following the arrests, the warnings, and the large deployment of Chinese armed forces, the entire region is very tense and under strict surveillance,” Yonten added. It is believed that the five Tibetans were arrested in connection with a Tibetan flag-raising incident that was reported from the region earlier this September. In an expression of defiance against China’s rule, protesters pulled down a Chinese flag and raised the Tibetan national flag at a school in Wonpo on September 7. Leaflets carrying the words ‘Freedom for Tibet,’ written in red ink were also found scattered on the school grounds. Although, local Chinese officials did not make any arrests, they vowed to investigate the incident. In the same region, earlier this year in February, Tibetans had pulled down a Chinese flag at a flag raising ceremony. In continuing crackdown in the Wonpo region of Dzachukha, eastern Tibet, Chinese security forces have arrested seven more Tibetans in connection with a Tibetan flag raising protest that occurred earlier this September. Tamdin Dorjee's charred body lies on the ground after his self-immolation protest against China's occupation of Tibet on October 13, 2012. In confirmed reports coming out of Tibet, yet another Tibetan has set himself on fire in protest against China’s continued occupation of Tibet. Tamdin Dorjee, 52, set himself on fire around 1:00 pm (local time) on October 13th Saturday in Tsoe, Kanlho region of north-eastern Tibet. Tamdin Dorjee passed away at the site of his protest. Eye witnesses have told sources in exile that Tamdin Dorjee raised slogans for the return of His Holiness the Dalai Lama and freedom in Tibet. According to Dharamshala based Central Tibetan Administration, his body was later taken to his home, following which a prayer service was conducted by monks at Tsoe Monastery. Local Tibetans are visiting his home to pay their last respects. Tamdin Dorjee is the grandfather of the 7th Gunthang Rinpoche, who is one of the most revered religious leaders in the region. The Monastery has been sealed off and Chinese Security forces have moved into the area. Intense restrictions are in place. Tsoe has already witnessed two self-immolations by Dolkar Tso and Sangay Gyatso. Both of them passed away in their fiery protests. 55 Tibetans have set themselves on fire since 2009 demanding the return of His Holiness the Dalai Lama from exile and freedom in Tibet. Sangay Gyatso's charred body lies on the ground after his self-immolation protest against China's occupation of Tibet on October 6, 2012. In confirmed reports and photos coming out of Tibet, another Tibetan set himself on fire today in an apparent protest against China’s continued occupation of Tibet. Exile sources say that a Tibetan man, Sangay Gyatso, 27, set himself on fire in Tsoe region of Kanlho, Amdo eastern Tibet at around 12 pm (local time). He carried out his protest near the Dokar Monastery. Sangay Gyatso, a father of two, is believed to have passed away in his self-immolation protest. In the photos of his fiery protest that have reached exile, Sangay Gyatso’s body is seen completely charred. Since 2009, a known number of 54 Tibetans have now set themselves on fire demanding freedom in Tibet and the return of His Holiness the Dalai Lama from exile. Sangay Gyatso’s protest comes only two days after a Tibetan writer, Gudrup passed away in his self-immolation protest on October 4 in Nagchu. The recently concluded meeting of exile Tibetans to discuss the ongoing crisis in Tibet had sent a strong message of unity and solidarity with Tibetans inside Tibet and a call for greater activism in exile. The special meeting, while expressing concern over the loss of Tibetan lives, declared that the Chinese government will be held solely responsible in the event of the situation inside Tibet escalating further. In light of the critical situation inside Tibet, the meeting had also recommended the revival of the ‘Tibetan Solidarity Committee’ to head the global Tibet activities and also pushed for the creation of a ‘voluntary emergency fund’ to finance the campaigns. Monks and local Tibetans gather at the Rongwo Monastery in Rebkong, eastern Tibet, to pray for Tibetan self-immolator Jamyang Palden, who passed away on September 29, 2012 after an ordeal that lasted for more than six months. China has refused to grant permission to an official Australian delegation from visiting Tibet, aimed at examining the reasons for the ongoing wave of self-immolations. The Australia Tibet Council has been told that Canberra’s request to visit Tibet, which continues to see a growing number of self-immolations, had been rejected. China’s abject dismissal of Australia’s concerns over the self-immolations came even as a Tibetan writer, Gudrup set himself on fire in Nagchu, central Tibet yesterday, taking the self-immolation toll inside Tibet to 53. Gudrup called for Tibet’s freedom and return of the Dalai Lama from exile - demands common to the rest of Tibetan self-immolators. In March this year, Australian ambassador Frances Adamson had sought Beijing’s permission to visit Tibet to “examine the reasons” for the ongoing wave of fiery self-immolations in Tibet. Adamson had also requested the Chinese authorities to allow a visit by the Australian parliamentary delegation. Chinese security personnel earlier this year detained several foreign journalists attempting to enter Tibetan areas, including reporters from the BBC and CNN. A new report released by a global coalition of Tibet groups on Wednesday blamed “decades of China’s failed policies” in Tibet for causing the ongoing wave of fiery protests in Tibet. “We will do whatever we can to support our brothers and sisters in Tibet and we squarely blame the present tragedy in Tibet on the hard-line policies of the Chinese government,” Sikyong Sangay had said. The US Secretary of State Hillary Clinton also recently expressed America's concerns over the increasing instances of self-immolations in Tibet and violations of human rights at a meeting with her Chinese counterpart Yang Jiechi. Just two days before the People’s Republic of China celebrates its 63rd National Day, a Tibetan in eastern Tibet has set himself on fire calling for Tibet’s independence. Yungdrung, a 27-year-old Tibetan man, set himself ablaze in Zatoe town of Yushul, eastern Tibet on September 29, Saturday. According to India based Tibetan language new portal, Tibet Express, Yungdrung was dressed in complete Tibetan attire and raised multiple slogans as he carried out his self-immolation protest near rows of shops. “While engulfed in flames, Yungdrung called for independence of Tibet, the return of His Holiness the Dalai Lama and Gyalwang Karmapa from exile, and addressed Dr Lobsang Sangay (the elected leader of Tibetan people) as the king of Tibet,” the report quoted sources as saying. According to eyewitnesses, Yungdrung was severely burned by the time Chinese security personnel arrived at the scene and whisked him away to an unknown location. His wellbeing is not clearly known, but the report suggested that Yungdrung passed away this morning while being taken to a nearby place in China. Tibet Express said that a few days before the incident, Tibetans in the region were forced by Chinese authorities to take part in the filming of a show portraying that Tibetans were happy under Chinese rule. “The Tibetans expressed their unwillingness to take part in the show this year thus leading to the protest by Yungdrung against the Chinese government,” the report quoted an unnamed source in the region as saying. Since 2009, a total of 52 known Tibetans have set themselves on fire in Tibet demanding freedom and the return of the Dalai Lama from exile. On June 20, Ngawang Norphel, 21 and Tenzin Khedup, 24, set themselves on fire in Zatoe town protesting China’s continued occupation of Tibet while holding Tibetan national flags in their hands. Both of them have passed away. Yungdrung’s self-immolation protest comes days after Tibetans in exile met for a grand special meeting to discuss the ongoing crisis inside Tibet. In his concluding remarks, Sikyong Dr Sangay said the meeting has succeeded in sending a strong message of Tibetan unity to the Chinese government. “We came here to show our solidarity and unity with Tibetans inside Tibet and to send a strong message to the Chinese government that we do not tolerate their present policies and the continued occupation of Tibet,” the de facto Tibetan prime minister said.